MGO™ 550+ Manuka Honey Blend is derived from Leptospermum Scoparium, a plant unique to New Zealand; its flowers are powerfully fragrant and full of nectar, which attributes Manuka Honey with its rich, dark and full-bodied flavour. MGO™ 550+ Manuka Honey is certified to contain a minimum of 250mg/kg methylgyoxal. Methylgyoxal is a naturally occurring compound in Manuka Honey that lends the substance its remarkable and unique properties. No other system of measurement gives such a clear and simple indication; the higher the MGO™ rating, the higher the Methylglyoxal content. All of our MGO™ Manuka Honey products are scientifically tested and verified to ensure you are getting consistent quality. Every batch is subjected to laboratory tests that measure various quality parameters including Dietary Methylglyoxal content. Great care is taken to ensure that the Methylglyoxal is maintained from the bee-hive to the finished product so you do not lose any of the valuable properties of this remarkable honey. 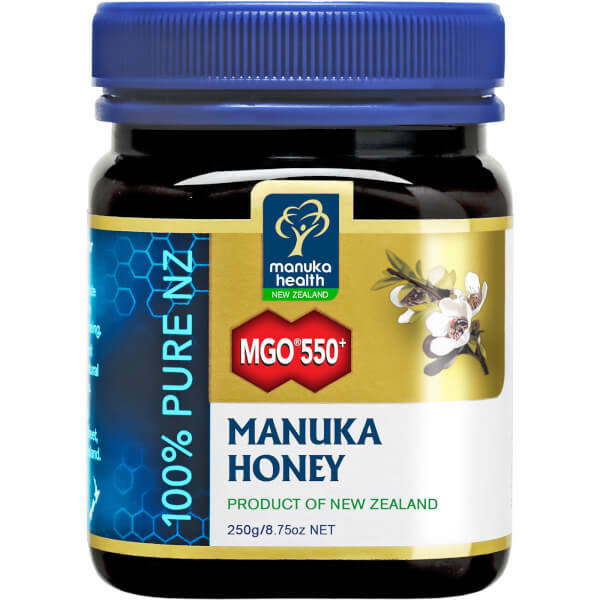 100% New Zealand MGO™ 550+ Manuka Honey.